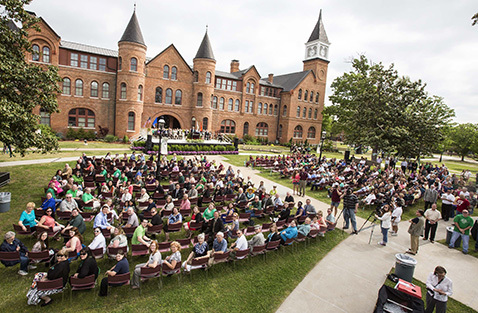 Northeastern State University’s historic Seminary Hall celebrated its 125th anniversary May 7. Many attended the event to hear about the rich past of the building. NSU President Steve Turner announced NSU’s Lighting the Way campaign and the Light the Way emergency scholarship. NSU met their goal and raised $125,000 for the anniversary celebration. The University of Central Oklahoma celebrated the achievements of approximately 2,183 graduates, including 467 summer graduates, during the spring 2014 Commencement ceremonies May 9-10 in Hamilton Field House on Central’s campus. It was the largest commencement class in Central’s history. 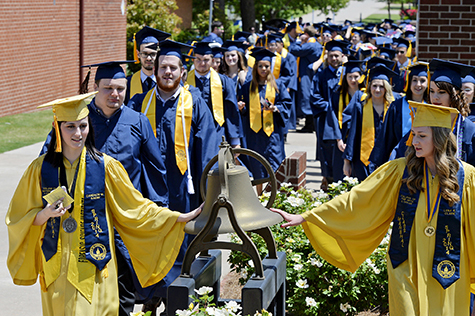 Pictured: Spring 2014 class marshals Candace Baker (College of Math and Science) and Lena Clark (College of Fine Arts and Design), touch the bell in front of Old North, a UCO tradition, as they lead their colleges into commencement. OSU-Oklahoma City graduated a record 1,086 students from its fall, spring and summer semesters during the university’s 2014 Commencement, the highest number of graduates in its 51 years of history. The ceremony included bachelor's and associate degrees as well as certificates. 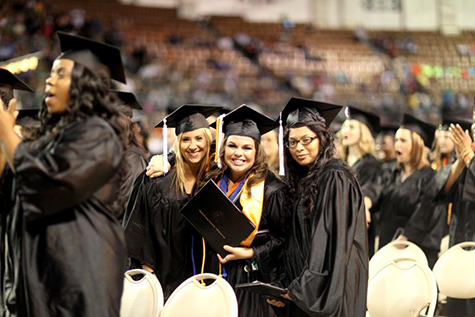 Pictured are OSU-OKC graduates Angela Looper, Michelle Peterson and Celina Enriquez clutching their diplomas after walking across the stage during the university’s Commencement at the State Fair Arena.